Rapid action clean and shine polish. Contains silicones for easy polishing and superior resistance to staining. High shine performance polish, perfect for melamine and vinyl surfaces. Fresh perfume leaves that “just” cleaned fragrance. Easy to use, fast shine Cleaning Squad removes fingermarks, smudges, dirt and dust at a wipe from most everyday surfaces. 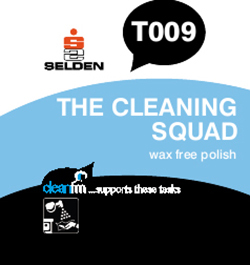 Wax free with a high shine, it is ideal for office cleaning and general surfaces. Use on wood, ceramics, tiles, shelves, vinyl, paintwork, metal, enamel, chrome etc. Composition An aqueous emulsion of silicones and perfume.